A review in 10 words (or thereabouts): As a storm approaches, a young girl must overcome her fears and allow herself to grieve for the loss of her family. I'm a sucker for summer stories. Now and Then...Stand By Me...there's just something about a story where a kid is yearning to be an adult, and yet, still holding on desperately to their youth. Will & Whit follows a similar plot line. During the last days of summer, when school and responsibility are just around the corner, Wilhelmina and her friends are trying to create lasting memories with a theater troupe that is planning a carnival in town. As always, this is easier said than done. Will is grieving the loss of her parents; Autumn, the best friend, is trying to reconcile parent expectations with future plans; and Noel, the other best friend, is fighting with unrequited love. When a storm knocks the power out in town, the three friends will have to face their fears. As stories go...this one was okay. Not great, but okay. I wanted more. Perhaps I've been reading to many issue books that really delve into the problem. For Will, everything is on the surface. Her grief has manifested itself as a fear of the dark, and she tries desperately to keep the shadows at bay by making beautiful lamps and lights. In a cool move, the author uses the shadows as a part of her storytelling, morphing them into different images that go along with Will's fears. Each of her friends are going through their own troubles and tribulations, but on some level, they seemed superficial. I never felt like I really got to know any of the characters, as likable as they were. 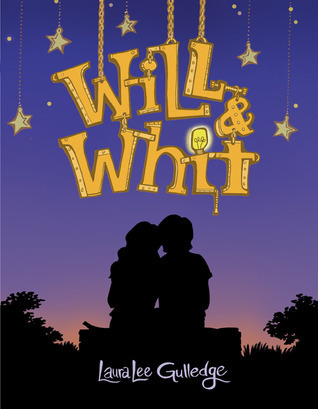 Still, it's a very easy book to recommend, and if you're looking for characters with heart, give Will & Whit by Laura Lee Gulledge a read.